The standing Celtic cross is made in Ireland by Liffey Artefacts. 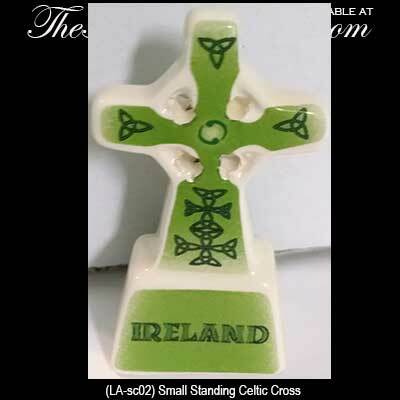 This small standing Celtic cross features green on green Celtic knots on both sides with bonus shamrocks on one side and Ireland on the reverse side. 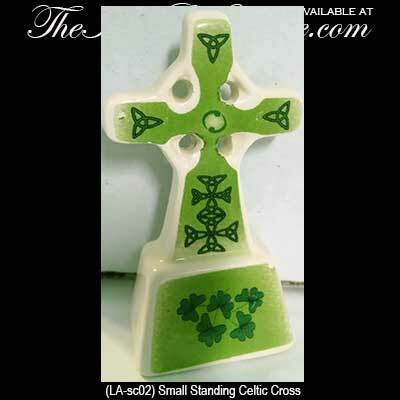 The porcelain cross measures 1 1/2" wide x 3" tall x 7/8" deep and is packaged with shamrock, Celtic knot and Celtic cross history cards, complements of The Irish Gift House.